Denis Boucher grew up in Quebec, made the pros as a pitcher and even played in the bigs over four seasons - for both the Blue Jays and Expos, as well as the Indians. In 2017, he saw a youth baseball field named for him in Montreal, marking his success in the game, but also his efforts to promote to the game to Quebec youth as president of Baseball Lachine, according to The Suburban of Montreal. "It's a great honour and nice to be recognized," Boucher told The Suburban. "And it’s great to have everyone here, even one of my first coaches in Quebec City. He coached me for five years and he is still involved in the Sports-Etudes program there." Boucher's career in baseball began in 1987, signed by the Blue Jays as an undrafted free agent out of his native Quebec. He hit the field for the Blue Jays in 1988 at single-A Myrtle Beach. He went 13-12, with a 2.84 ERA. he moved to high-A Dunedin in 1989 and then made the jump to AAA Syracuse by mid-1990. 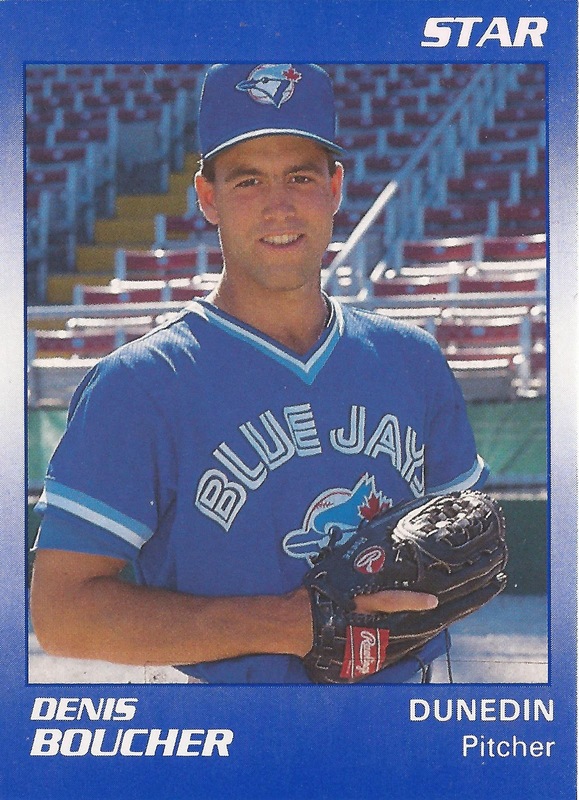 Boucher made Toronto to start 1991, despite undergoing elbow surgery after the 1990 season. In seven starts, he went 0-3, with a 4.58 ERA. He went seven innings, giving up a single earned run in his second start, a no-decision. He didn't get his first win until July, after a trade to the Indians. "I just feel great about tonight," Boucher told The Los Angeles Times after he pitched into the eighth inning against the Angels. "I kept my ball down and they hit a lot of groundballs." He then developed tendinitis after a return to the minors. Boucher returned to Cleveland for 1992. He got into eight games and went 2-2, with a 6.37 ERA. He arrived with the Expos by way of the Rockies and Padres. "I had tears running down my cheeks," Boucher told the authors of Ecstasy to Agony, according to Sabr. "I was so happy to be coming home." He started five games for the Expos in 1993 and got into 10 games, starting 2, there in 1994 to end his major league career. He played three more seasons in the minors, the first two with the Expos and the last in independent ball to end his career. Bouche then turned to coaching and scouting. He's scouted for the Yankees and he's coached Montreal's youth. "You always have to think about the athlete, not yourself," Boucher told Coach.ca of his approach. "Often, you will hear coaches say 'that was my athlete, I'm responsible for his success,' but the truth is, the athlete always comes first, let him or her have the spotlight. Coaches are there to support their athletes, to motivate them and to give them confidence, not to outshine them."